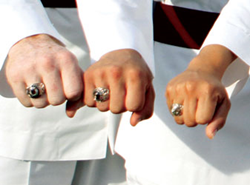 Fifty-four class rings were donated this year to the West Point Association of Graduates16th Annual Ring Melt Ceremony. The February 22nd ceremony begins at 9:00 a.m. at the Rhode Island refinery, Pease & Curren. The rings, from classes ranging from 1914 to 1984, will be melted into a solid gold bar that will be incorporated into the gold used to create the rings for West Point’s Class of 2017. All of the Class of 2017’s rings will contain not only part of this year’s donations, but also a portion of all of the rings donated since the Ring Melt Program’s inception with the Class of 2002. The annual Ring Melt is a tangible way to reaffirm the bond between today’s cadets and their distinguished predecessors. Families who donated the rings are commemorating their husbands, fathers, brothers, cousins, friends, and classmates through the ceremony. Donors from all over the country are attending the Ring Melt Ceremony. The relatives of 23 of the donors will be on hand to present the rings for melting. The oldest ring melted this year belonged to Major General Jens A. Doe, Class of 1914. He was the commanding officer of the 14th Machine Gun Battalion in World War I. Prior to this melt, 356 rings have been donated and melted, spanning the classes of 1896 to 1997. Each year a sample is extracted from the ingot of melted rings and then added to the melt of the following year to ensure that gold from all ring melts going back to the inaugural ceremony in 2001 is included in the production of rings for the upcoming senior cadets. This ‘legacy’ sample, physically and symbolically, links The Long Gray Line with its newest members, the Class of 2017, when they proudly don their class rings in an August ceremony at West Point. The February 22nd event will be held at Pease & Curren, a Warwick, RI precious metals refinery that has hosted the event for the past 14 years. The company’s involvement first began with a suggestion from their then-Vice President of Sales, Keith Edwards, a USMA graduate from the Class of 1985. About Pease & Curren, Inc.
Pease & Curren is a third-generation precious metals refinery celebrating 100 years in the refining business. The “Pease & Curren way” is disciplined, honest, consistent, and reputable. We provide the most accurate precious-metals refining available on the market today, bringing consistently higher yields to our customers, resulting in maximum returns.